Continuing education and training for natural resource professionals is critical in order to address the changes and challenges of our environment. OSBS has served as a facilitator and training platform for agencies, private firms, and students since its inception. The Station is well suited for classroom-based workshops mixed with field training opportunities. The southeast US has a diverse array of natural communities and unique environmental conditions. Fire is one of the primary natural disturbances that shapes many of the plant communities found in this region. 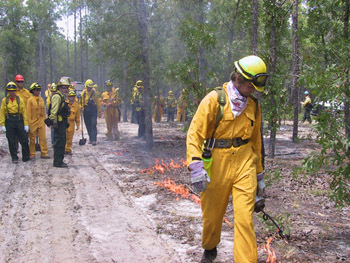 Because OSBS has many pyrogenic systems, wildland fire training has been ongoing at the facility for several decades. National Wildfire Coordinating Group (NWCG) wildland fire courses are taught each year in conjunction with The Nature Conservancy. The Natural Areas Training Academy (NATA) utilizes OSBS for workshops and training. In the winter and spring months, agency participants from the National Interagency Prescribed Fire Training Center (PFTC) visit the Station and partake in live fire exercise trainings to gain experience in conducting prescribed fires. Access to natural resources such as flora, fauna, water, soils, plant communities to enhance the training focus. Interactivity with resource management processes such as prescribed fire, exotic-invasive species, and habitat restoration.